As a result of global dynamics—the increasing interconnection of people and places—innovations in global environmental governance haved altered the role of cities in shaping the future of the planet. This book is a timely study of the importance of these social transformations in our increasingly global and increasingly urban world. Through analysis of transnational municipal networks, such as Metropolis and the C40 Cities Climate Leadership Group, Sofie Bouteligier's innovative study examines theories of the network society and global cities from a global ecology perspective. Through direct observation and interviews and using two types of city networks that have been treated separately in the literature, she discovers the structure and logic pertaining to office networks of environmental non-governmental organizations and environmental consultancy firms. In doing so she incisively demonstrates the ways in which cities fulfill the role of strategic sites of global environmental governance, concentrating knowledge, infrastructure, and institutions vital to the function of transnational actors. "Bouteligier's insightful turn to emphasize globalizing urban networks get us past the usual crusty categorizations of some cities as global—and most as not. Her book does the hard empirical and critical work that enables a basic rethinking of the possibilities for innovative environmental governance. It is compelling." 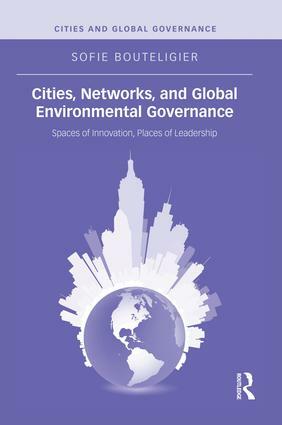 "Bouteligier's extensive and empirically rich study of networks of consultancy firms, non-governmental organizations and municipal governments sheds new light on how, why, and with what implications cities are playing a role in global environmental governance. It provides an important bridging point between the literatures on globalization, global cities, and environmental governance, and will be an important reference point for scholars engaged in these increasingly intertwined debates." Sofie Bouteligier conducted her PhD research at the Global Environmental Governance and Sustainable Development Research Group of Kuleuven, Belgium. Currently, she is a postdoc researcher at the Environmental Policy Group of Wageningen University and an associate fellow of the Leuven Centre for Global Governance Studies. Her research focuses on city networks for global environmental governance and the interactions between multinational private companies and cities in the search for sustainable urban futures. Scholarly concern over the role of cities as sites for global governance and the organization of global activities has increased substantially over the past 25 years. The partial denationalization of global politics has been accompanied by the increasing importance of non-state and sub-national state actors, including municipal governments. It has further resulted in the rising significance of cities as sites in and for global governance. Cities serve as platforms for scale-jumping—the movement of organizations and issues across scalar boundaries—locales for networking, and sites for the convergence of disparate global ideologies. Global actors, by concentrating in cities, take advantage of propinquity and the dense networks available in the urban landscape to organize their activities, and in doing so, also establish certain cities as "nodes" in their global networks. At the same time, global ideologies are expressed in urban landscapes and global politics takes concrete form in cities. Because of these developments, scholars of global affairs have expressed increasing interest in the presence and influence of the city in global governance. This series will feature unique perspectives on theoretical and empirical issues in the relationship between cities and global governance. The series will serve as a platform to theorize previously undertheorized aspects of the relationship, to challenge conventional wisdom in the field, and to offer new empirical analysis of the role of cities as sites and actors in global governance as well as the role of global governance on the ground in cities. Each volume will make a distinct contribution to one or more of these questions. Volumes may take various conceptual and methodological approaches. Some will study cases, others will examine networks; some will have a regional focus, others will have a global focus; some will be focused on cities as they intersect with particular issues in global governance.